Fred Schuster, Ankeny, Iowa, has been appointed by the President as Regional Director for Region VI of the U.S. Department of Health and Human Services. HHS Region VI includes the states of Arkansas, Louisiana, Oklahoma, New Mexico and Texas, as well as 68 Federally-recognized tribes and is headquartered in Dallas, Texas. As Regional Director, Mr. Schuster serves as HHS Secretary Alex Azar's representative responsible for guiding and coordinating HHS policies. He also facilitates communications regarding HHS initiatives as they relate to state, local and tribal governments. Mr. Schuster is a Business graduate from Iowa State University. He was inducted into the university's highest honorary society and was elected to a student government position every year including as President of the Student Body. Also while attending ISU, Mr. Schuster served as a Volunteer in Service to America (VISTA) volunteer. While he was with VISTA, Mr. Schuster conducted legal and environmental research. His research, and the research of others on the team, were later published by ISU. Mr. Schuster was hired by U.S. Senator Chuck Grassley to be Regional Director for his office in Des Moines and then later the Waterloo and Cedar Rapid offices. Mr. Schuster traveled thousands of miles both with Senator Grassley and on his own throughout Iowa and held hundreds of public meetings to answer questions, or help people having problems with healthcare and scores of other issues. 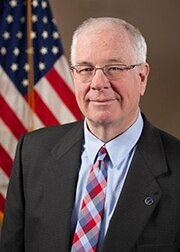 He also served as the Business and Economic Liaison for Senator Grassley. This position had state-wide responsibilities, which among other duties, required him to plan and raise the funds for, diplomats from 55 countries, many were Ambassadors, to visit numerous economic, agricultural, educational and cultural sites to help promote trade. During the Presidency of George W. Bush, Mr. Schuster was appointed to be the HHS Regional Director for the U.S. Department of Health and Human Services for Region VII, which included the states of Iowa, Kansas, Missouri and Nebraska. Among other issues, Director Schuster worked on Medicare Part D drug benefits, pandemic influenza preparation, quality measures and Value Driven Health Care. Mr. Schuster has donated over 20 gallons of blood and was a bone marrow donor. He has regularly taken CPR training, which he put to use in helping to save a life. Mr. Schuster has two daughters and one grand-daughter. He began his duties in Region VI on December 17, 2018.